Below is the completed Mystery Quilt, composed of many more tiny squares than have ever crossed my table before for a project. Fortunately the errors aren’t too visible from here, and it makes me happy that my granddaughter, Isabella, is looking forward to receiving it. This is a photo of another project I posted on earlier. The blue fan squares were part of a 1930-40 quilt top which was quite misshapen and had never been finished by its creator. The blocks were taken apart and reconstructed into flowers. 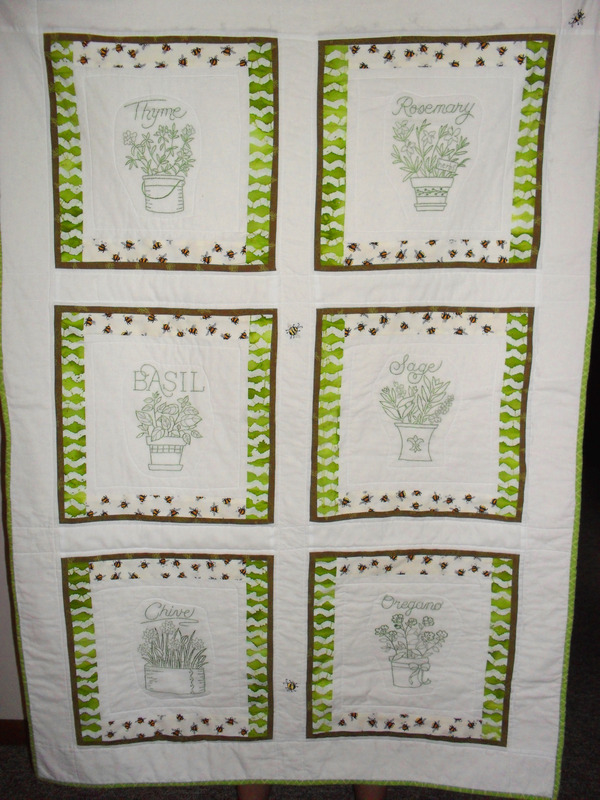 White sashing and borders were then added and I spent the entire winter hand quilting it during the long evenings. The idea came from a presentation by Tim Latimer, but, unlike Tim, I am not very fast. So, at last, gardening time is approaching and I have lots of smaller projects on the way. Happy May! 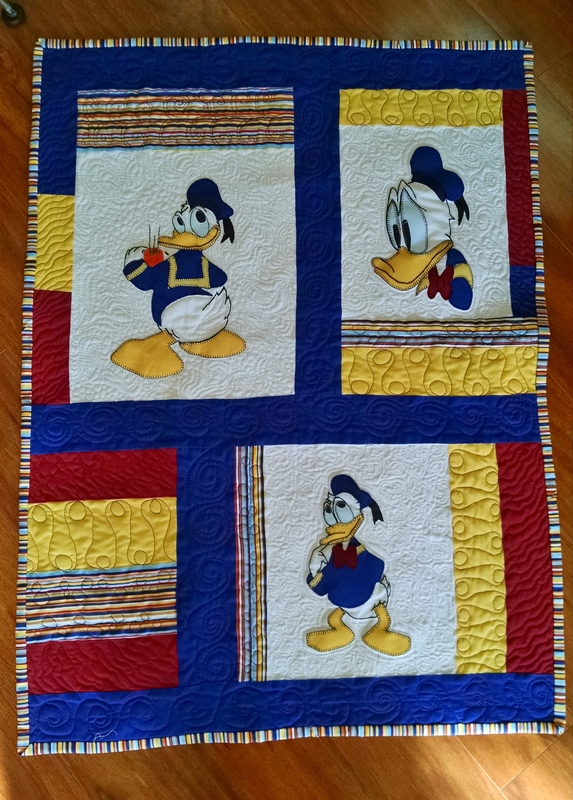 The second of my free-motion practice quilts produced better results. 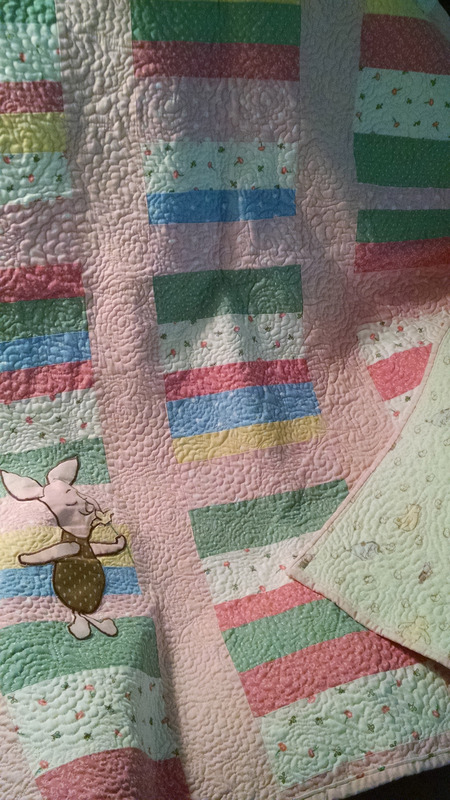 Someone had donated Winnie-the-Pooh flannel, which inspired adding Piglet to the front. 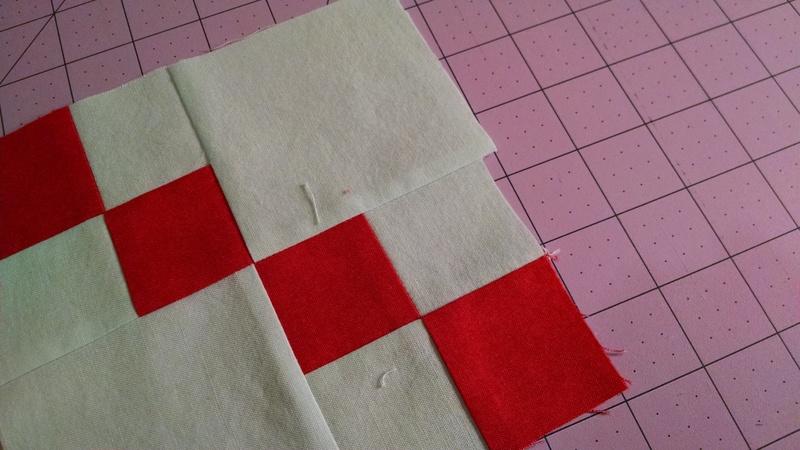 I discovered a free-motion pattern that pleased me and seemed easy to do, and was on my way. 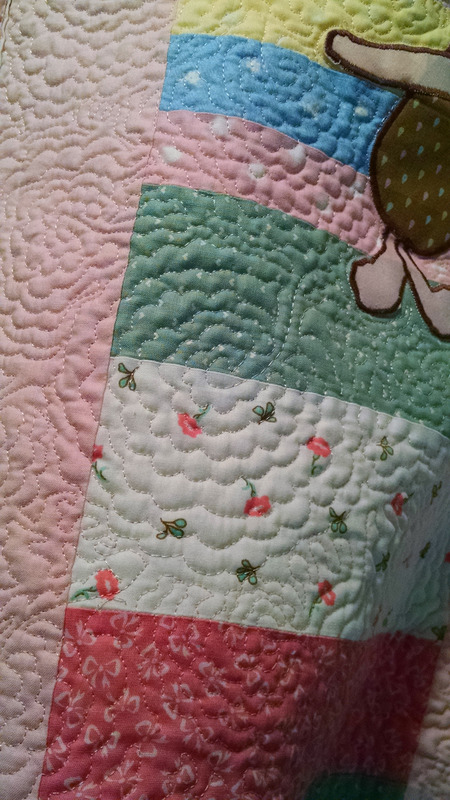 I have read from other quilters that each quilter finds they are drawn more to either curvy designs or linear designs. I seem to be a curvy. This was fun and relaxing. Unfortunately there are places on the back that do not yet please me. I have learned that speeding through the sharpest part of the turns can create messy bobbin threads. Another case of “slow and steady” winning the race. 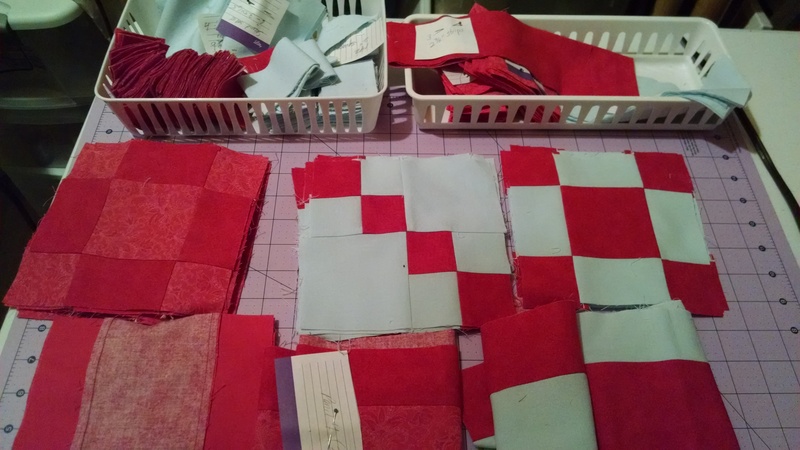 Today I picked up the materials list for my free-motion class with Patsy Thompson, and see that I must have 15 to 20 9X12 inch quilt sandwiches ready to go by next Tuesday. Sounds as if she will work us hard. You can check out her website by Googling. Much to see there. 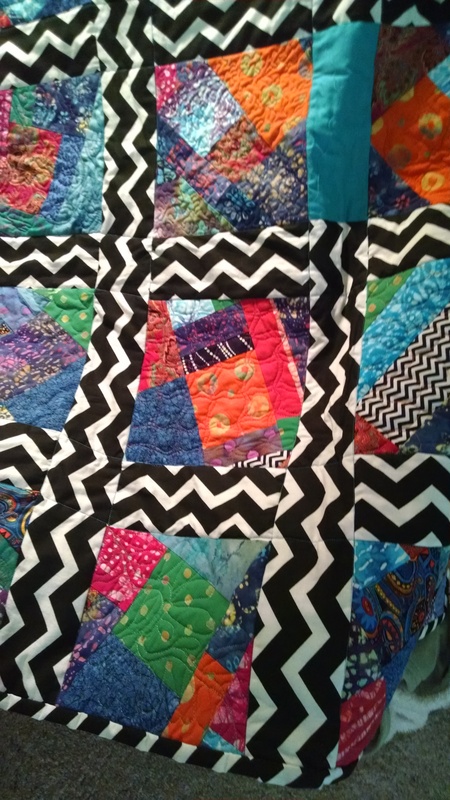 Soon after becoming serious about quilting, myself, a friend asked for assistance in making a queen-size quilt for her bed. This sounded pretty daunting to a beginner, but after a little research we came up with the method shown above. We created 10 inch squares using randomly cut strips. (No piecing to cut!) We then added a layer of batting and quilted each square in 3/4 inch lines. Using the number of squares she desired to create the size she wanted, we laid the squares out in a pleasing pattern, then stacked them up, labeling the rows for assemble. We sewed the squares into vertical rows, then began to assemble. She chose a queen-size sheet in white as her backing and we folded it in half vertically and ironed it, to find the center. 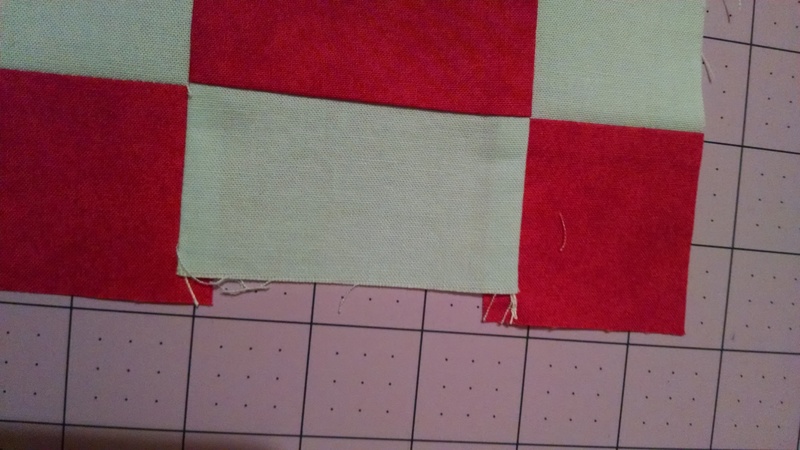 We then placed the center vertical row in relation to the center line, turned it face down, and stitched from the center to the edge of the quilt in each direction, to attach it to the backing. In this manner, working from the center out, we attached each row in succession. We were then able to turn the whole thing over and do a bit of extra quilting by stitching in the ditch from the center out. (Not a lot is required, as the batting is already well attached, but at least you will want to go between the blocks horizontally.) Once again, we had to work from the center out. We finished with a traditional binding in the green polka-dot print. My friend assembled pillowcases and decorator pillows from remnants and was pleased and excited by her very first quilting experience! These early photos are not very clear, but as the work is that of an early student, that may be just as well. 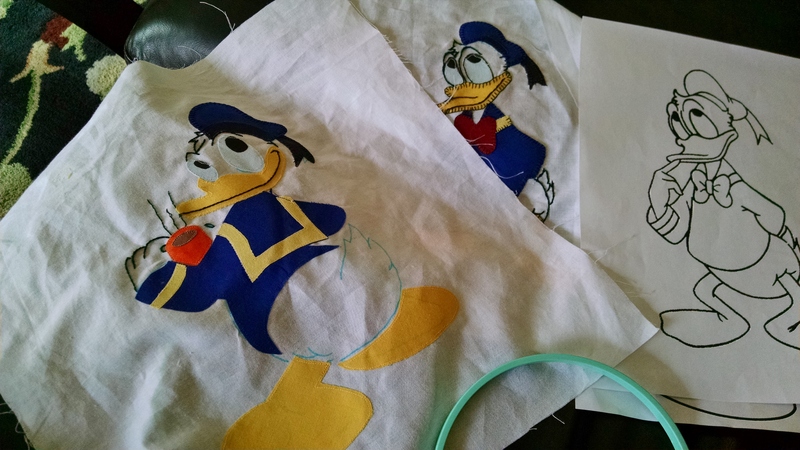 Both are in a style I still enjoy producing, as the embroidered parts are easy take-along projects. 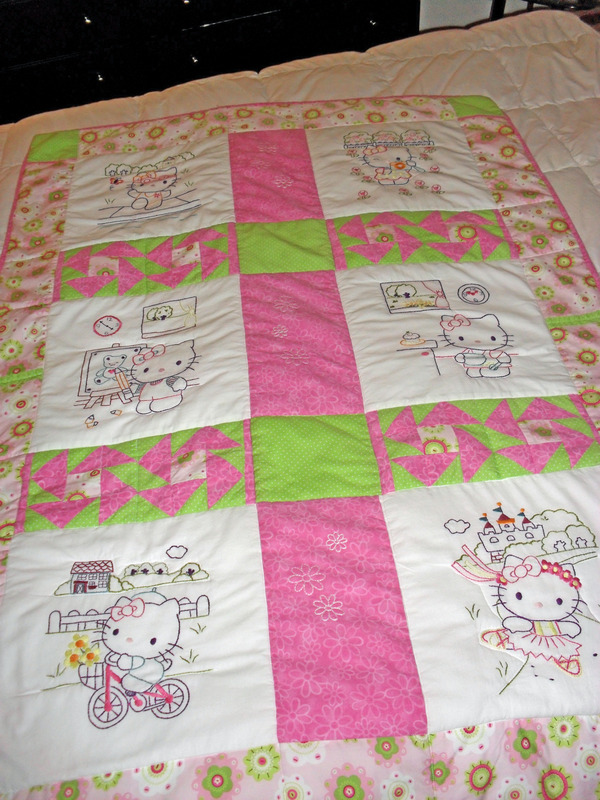 The Hello Kitty quilt made use of transfers produced by copying coloring book pages onto transfer paper. This, of course, cannot be produced for sale, but mine was for a new granddaughter. 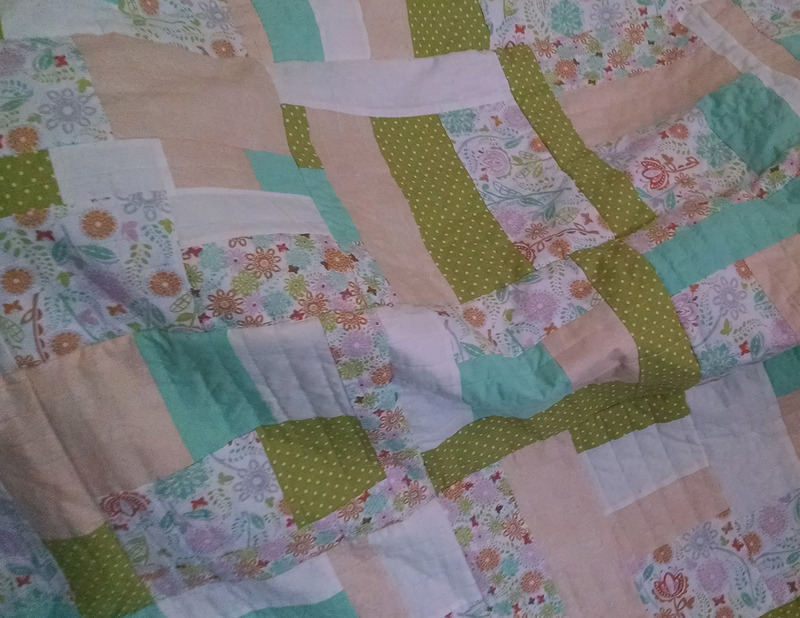 Both quilts have flannel backings, which are wonderful for cuddle comfort, but which necessitated machine quilting. 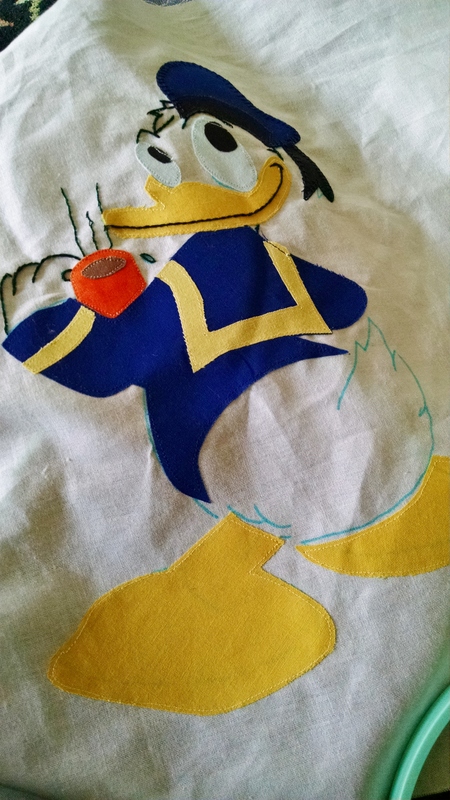 I had begun hand quilting, at this point, but had little experience with machine quilting, so these have only simple quilting along seam lines and around the embroidered images. On the herb quilt I only encircled the images, so the Hello Kitty was slightly more sophisticated with it’s stitching done very close to the images, which did enhance them a bit.